When we first moved to town six years ago, one of the first breakfast places people really recommended was Maggie’s Campus Cafe. It took a few months, but we finally made it one Sunday morning and joined the hungover college crowd for delicious, hearty breakfast food. That location closed due to a dispute with the property own and it’s now Breakfast at Tiffiny’s. It’s taken a better part of five years, but Maggie’s is back. The new Maggie’s Cafe & Kitchen is on Stadium Drive where Lenny’s Sub Shop used to be in the Stadium Shoppes development. The first thing we noticed about the Maggie’s is that it’s small. A good portion of the building is taken up by the kitchen which wasn’t needed in the old sub shop. The tables are packed in pretty tightly and there’s not many of them. We were lucky enough to find one table open on a Sunday just before noon. We sat down and a waitress brought over menus and got us drinks. J and I were still in breakfast mode, but L had already moved on to lunch. Both menus were available, so everyone got what they wanted. I went with the classic dish. The Breakfast Stew. I got the full order and I really didn’t need to. The half would have been fine. 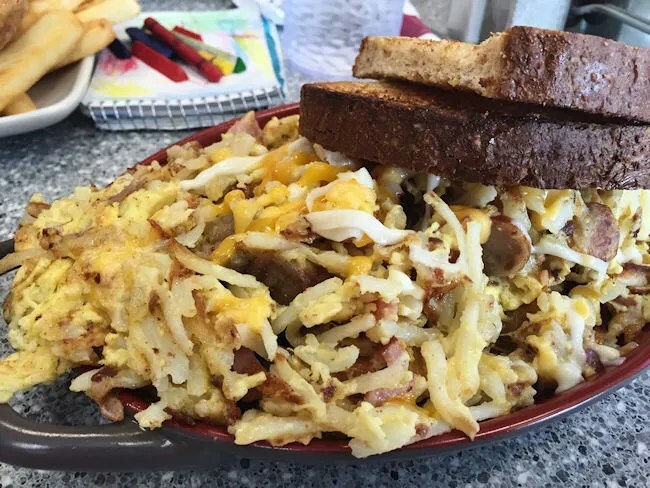 This dish that made Maggie’s famous in Kalamazoo is a “grilled skillet style dish” with scrambled eggs, hash browns, ham, bacon, sausage, and cheese. You also have the option to add onions and peppers if you want, but I didn’t want. The dish was so damn delicious. It’s really just a jumbled mess of ingredients, but it’s the proper breakfast ingredients in one place. If you do it right, you can get a little bit of each item in every bite and that’s what makes The Stew, I’ll say it again, so damn delicious. J went for the 1-1-1 & 1. This simple breakfast option gave her all the basics. 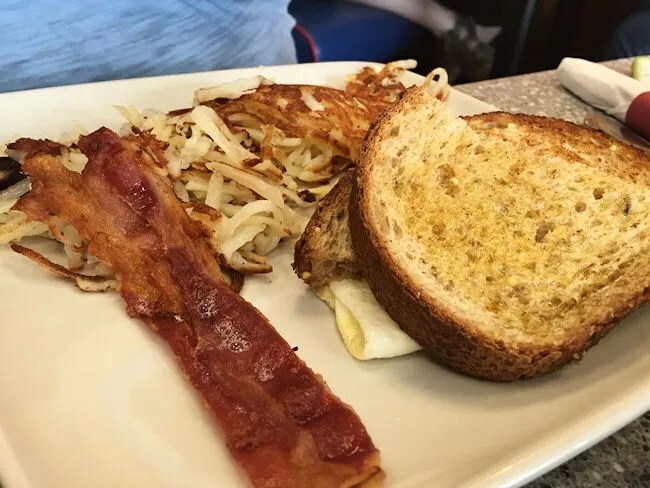 It came with one egg (scrambled), hash browns, bacon and toast. She had already had a light breakfast at home with L, so she wasn’t super hungry, but this plate did the trick. It provided all that delicious, greasy diner breakfast food that she was craving. L was the only one to go for the lunch menu and she was so proud of herself when she looked at the waitress and ordered “chicken and carrots.” Unfortunately, the didn’t have carrots and she had to “settle” for french fries. The tender, juicy chicken strips were right out of the fryer and very hot when she got them, so we let them cool down. 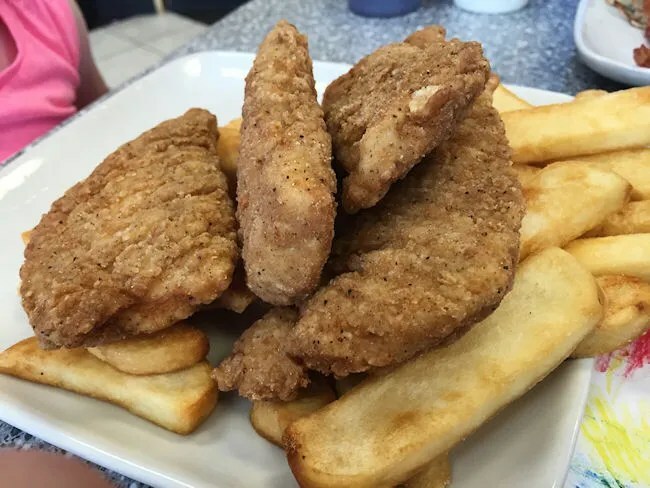 J stole one of the tenders thinking L wouldn’t eat them all, but after polishing off the other three, L looked at the plate and asked “Where’s all the chicken?” I don’t think even she realized that she just ate three huge chicken tenders. Our bill was right around $25 which is hard to complain about when you get three delicious breakfasts. 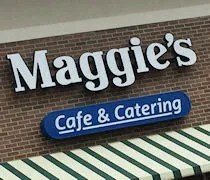 I know there was excitement when people saw the Maggie’s name go back up on a restaurant. The big advantage this place has over the old one is there’s no hungover college kids reaking of liquor. On the flip side, I’m sure that’s also a disadvantage for them not having the built customer base like they did near campus. 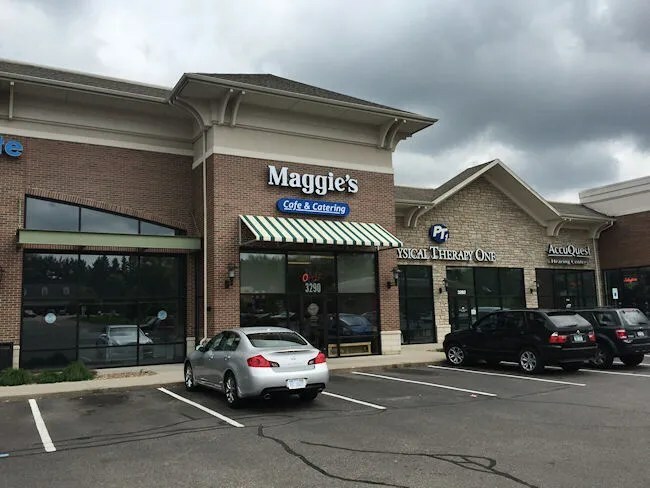 Still, Maggie’s has proved through the years that you will always get a quality breakfast from them and that’s what will keep us going back…that and The Breakfast Stew.